Forget cats and dogs, it has been raining pigs and chickens in the Northwest lately. This increase in waterworks gave me some time over the weekend to experiment in the kitchen, and I have wanted to try to make some energy bars for a while now. While rainy days make for good experiment days, they don’t necessarily make for good picture days, though. Taking nice food photos is a challenge when it is perpetually grey outside! Of all the protein/energy bars out there, Lara Bars are by far my favorite. They have simple ingredients and minimal processing. But, Lara Bars, like all pre-packaged energy bars, can really add up. The cheapest I’ve found them is $1.29 each at Trader Joe’s. If you eat one a day (which I could easily do), that’s about $475 a year in bars, if you’re buying them “cheaply.” They can go for as much as $1.69 each. Ay Dios Mio. 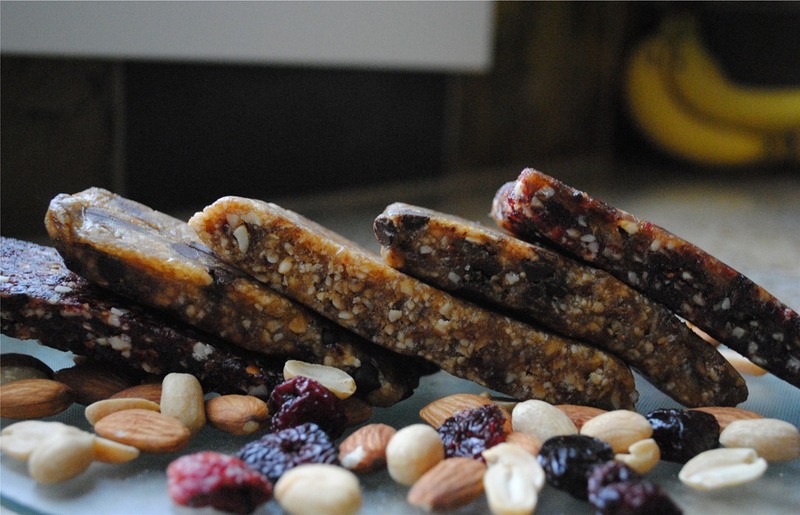 I don’t see myself coming up with any of the ingredients in a PowerBar; I don’t know about you, but I don’t have soy protein isolate or fractioned palm kernel oil in the pantry. So, Lara Bars, with their simple ingredients listed on the package, seemed feasible to replicate. My three favorite flavors are Cherry Pie, Peanut Butter Cookie, and Peanut Butter Chocolate Chip, so I set out to make those three. UPDATE: If you maybe prefer blueberry pie flavor, check out my Larabar Part 2 post over here. How did I figure this out, anyway? Well, it was a bit of an educated guess. Product packaging rules require manufacturers to list ingredients in order based on their percentage in the product. In studying the labels, it was clear that dates are the binder and main ingredient in most of the bars. That also means that there is a higher percentage of dates in the bars than any other ingredient. So, I knew that was my starting point. Once I made my first batch and figured out how many servings it would make, I input the ingredients into a recipe calculator to see where the calories netted out – in theory, they should be close to the calories on the Lara Bar package. And, amazingly, they were. After my first batch, I just needed to add one date to my ratio, and I was pretty close to the same calories. You can click the image to the right to enlarge the nutrition information. For a peanut butter chocolate chip cookie dough flavor, add 1-2 tablespoons of mini chocolate chips before you fold out onto the wax paper. I didn’t do the nutrition facts on this option because I couldn’t find the chocolate chips in the SparkPeople database, sorry! UPDATE: Optional: 1 scoop of your favorite plain or strawberry protein powder. I have been adding a scoop of Designer Whey strawberry protein powder before the dates lately, and it works great, and adds a good amount of protein to each bar. Use a food processor or high speed blender to grind the almonds and cherries into a very small texture. I ended up using my Ninja blender for this. I wrapped them individually in wax paper and put them in an airtight container in the fridge. I usually don’t figure out the cost of recipes, but this one was intriguing, so I calculated it out for the peanut butter and cherry flavors. Twenty-nine cents per bar?!! That almost seems impossible. That is potentially $365 back in my pocket every year, considering my one-a-day scenario above. Even at $0.54 per bar, you can make three bars for less than the total cost of one pre-made bar. In my opinion, that’s more than worth the effort! What’s your favorite Lara Bar? Will you try to replicate it now?